This festive fudge is the perfect addition to holiday cookie exchanges. Or, package the stars in cellophane for gift-giving. 1. Line 13- x 9-inch (3 L) baking pan with enough parchment paper to overhang edges; set aside. In saucepan set over medium heat, combine sugar, butter and International Delight coffee whitener Irish Crème flavour; bring to full boil, stirring constantly. Cook for about 5 minutes or until candy thermometer reaches 235˚F (112˚C) on candy thermometer for soft- ball stage. 2. Remove from heat; stir in chocolate, marshmallow fluff and salt. Stir until melted and smooth; pour into prepared pan. Let cool completely. 3. Remove from pan using parchment paper. Invert onto cutting board, remove parchment paper. 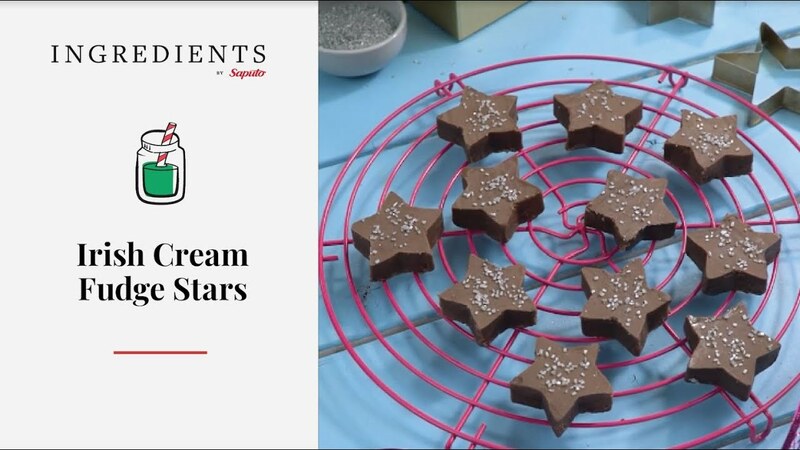 Using 1 1/2-inch (4 cm) star cookie cutter, cut into stars. Garnish with candy sparkles. Store in airtight container for up to 1 week. • Alternatively, use a mix of holiday cookie cutter shapes – Christmas trees, bells or mittens – to cut out fudge. • Cut fudge scraps into small pieces and add to popcorn trail mix if desired. • If you don’t have a candy thermometer, test by dropping a small amount of the cooked sugar mixture into very cold water; it will form a ball that does not hold its shape when pressed with your fingers.